John T. [sic] Hinshaw, age 30, born in North Carolina; farmer; $2000 real estate; $500 personal property. Mary Hinshaw, age 24, born in Indiana. Elizabeth Hinshaw, age 1, born in Indiana. Sarah E. Hinshaw, age 4 months, born in Indiana. Alfred Gibson, age 14, born in Indiana. Hinshaw, John S., age 40, born in North Carolina; farmer; $9600 real estate; $1000 personal property. Hinshaw, Mary J., age 34, born in Indiana; keeping house. Hinshaw, Sarah E., age 10, born in Indiana; attended school. Hinshaw, Mary E., age 8, born in Indiana; attended school. Hinshaw, William H., age 7, born in Indiana; attended school. Hinshaw, Nancy J., age 6, born in Indiana; attended school. Hinshaw, John C., age 5, born in Indiana. Hinshaw, Thomas M., age 4, born in Indiana. Hinshaw, Martha A., age 3, born in Indiana. Hinshaw, Stephen S., age 1, born in Indiana. Hoover, Gibson, age 20, born in Indiana; farm laborer. Hinshaw, J.S., age 50, born in North Carolina; parents born in North Carolina; farmer. Hinshaw, Mary J., wife, age 43, born in Indiana; parents born in Indiana; keeping house. Hinshaw, Sarah E., daughter, age 20, born in Indiana; father born in North Carolina; mother born in Indiana. Hinshaw, William H., son, age 18, born in Indiana; father born in North Carolina; mother born in Indiana; farm laborer. Hinshaw, Nancy J., daughter, age 16, born in Indiana; father born in North Carolina; mother born in Indiana. Hinshaw, John C., son, age 15, born in Indiana; father born in North Carolina; mother born in Indiana; farm laborer. Hinshaw, Thomas M., son, age 13, born in Indiana; father born in North Carolina; mother born in Indiana; farm laborer. Hinshaw, Martha A., daughter, age 12, born in Indiana; father born in North Carolina; mother born in Indiana. Hinshaw, Stephen S., son, age 10, born in Indiana; father born in North Carolina; mother born in Indiana; attended school. Hinshaw, Lemuel A., son, age 7, born in Indiana; father born in North Carolina; mother born in Indiana. Hinshaw, Rose May, daughter, age 1, born in Indiana; father born in North Carolina; mother born in Indiana. 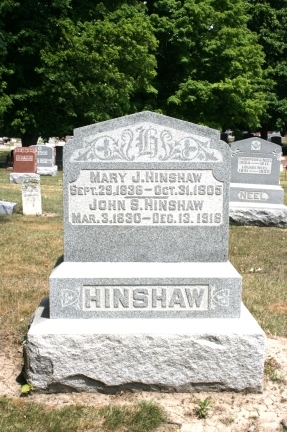 Hinshaw, John, age 70, born Mar 1830 in North Carolina; parents born in North Carolina; married 43 years. 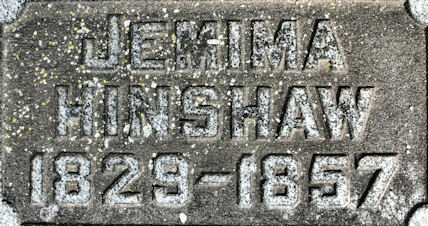 Hinshaw, Mary J., wife, age 63, born Sept 1836 in Indiana; parents born in Ohio; married 43 years; 11 children, 2 living [sic]. Hinshaw, Stephen, son, age 31, born June 1869 in Indiana; father born in North Carolina; mother born in Indiana; single. Hinshaw, Thomas, son, age 34, born Sept 1865 in Indiana; father born in North Carolina; mother born in Indiana; married 10 years. Hinshaw, May, daughter, age 20, born Sept 1879 in Indiana; father born in North Carolina; mother born in Indiana; single. Hinshaw, Marie, granddaughter, age 9, born Feb 1891 in Indiana; parents born in Indiana. Hinshaw, Kent, grandson, age 1, born July 1898 in Indiana; parents born in Indiana. Hinshaw, Raymond, grandson, age 1, born Jan 1899 in Indiana; parents born in Indiana. Hinshaw, John S., father-in-law, age 80, born in North Carolina; parents born in North Carolina; widower; occupation: retired farmer. 1870 census, Zionsville/Carmel P.O., Clay Township, Hamilton County, Indiana; roll M593-319, page 41, line #15, dwelling #201, family #197. Indiana Marriages, 1845-1920; http://www.ancestry.com (Book C-4, page 12). Indiana Marriages, 1845-1920; http://www.ancestry.com (Book C-1, page 37). Indiana Marriages, 1845-1920; http://www.ancestry.com (Book C-1, page 13). Indiana Marriages, 1845-1920; http://www.ancestry.com (Book C-2, page 5). Indiana Marriages, 1845-1920; http://www.ancestry.com (Book C-1, page 130). Indiana Marriages, 1845-1920; http://www.ancestry.com (Book C-4, page 6). Indiana Marriages, 1845-1920; http://www.ancestry.com (Book C-6, page 31). 1910 census, Clay Township, Hamilton County, Indiana; roll T624-353, ED 94, page 54A, line #21, dwelling #110, family #114. Indiana Marriages, 1845-1920; http://www.ancestry.com (Book 1, page 338). Indiana Marriages, 1845-1920; http://www.ancestry.com (Book 2, page 81). 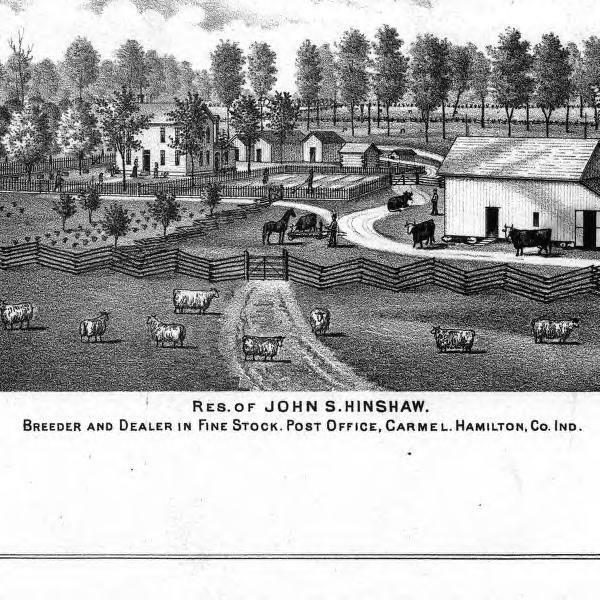 1860 census, Zionsville P.O., Clay Township, Hamilton County, Indiana; page 389, line #40, dwelling #1230, family #1230.